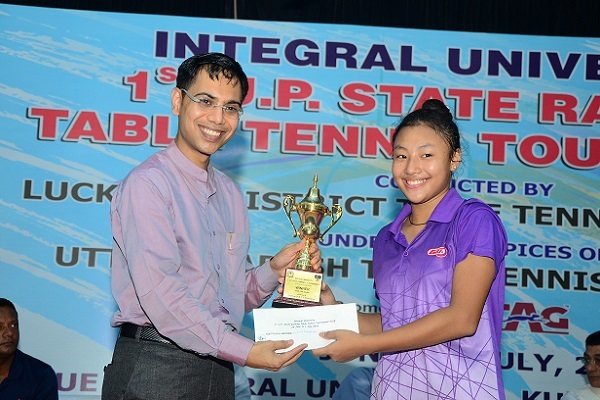 Paddlers give their best at the Integral University 1st U.P State Ranking Table Tennis Tournament. The Battle of pace and concentration concluded with immense praise and adulation for all the participants at the Integral University 1st U.P. State Ranking Tennis Tournament on Sunday, 1st July. Abhinav, Radhapriya, Akash, Sarth, Suhana, Akshat, Ambika, Aranis and Tejasi at the Top of the game. 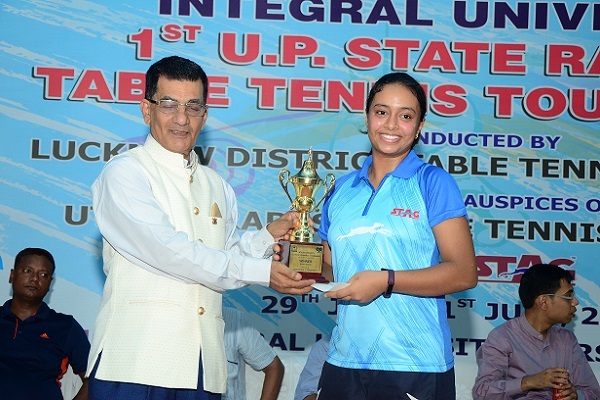 It was the first time in the history of Uttar Pradesh Table Tennis Association that the stupendous number of participant entries were received which has gone up by many folds from previous years and such remarkable excitement to the game was witnessed during the 3 days Table Tennis tournament. The Integral University Table Tennis Arena echoed with loud cheer to support the finalists. Prof Basheer Ahmad, Advisor to Chancellor, Integral was the chief guest of the occasion. The Final matches were a treat to watch where Abhinav Belwal won a golden Double, finishing top in both Men’s and Youth boys categories. Akash Tyagi bagged the Junior Boys title, whereas Sarth Mishra excelled in sub junior category. Radhapriya Goel claimed the women’s Single’s crown, whereas Manan Miglani and Anika Gupta finished runners-up in the cadet boys and girls sections, respectively. Despite losing the first two games Sarth staged a remarkable comeback to beat his city mate Akhat Tyagi 5-11, 2-11, 11-7, 11-9, 11-8 in the sub Junior boys final. On the other hand top seed Aranis Bana beat Manan Miglani 11-8, 11-8,11-4 in the cadet boys Final. Third seed Radhapriya defeated top seed Suhana Narginari of Moradabad 11-4, 8-11, 11-6, 15-13 in the women’s singles final. Integral was the host to the event where in more than 500 players and their parents, coaches and other staff were made comfortable in the University guest houses. Dr. Syed Nadeem Akhtar, Director, Planning and Research, Integral and President of Lucknow Distt. T.T. Association ensured the smooth flow of the events. The University sponsored the lodging and food for all the guests attending the tournament, who were pleased with the courtesies extended to them by the University administration. The Championship was inaugurated on 29th June by Shri Alok Sinha,IAS, Additional Chief Secretary, govt. of U.P. who believed that the young players of the tournament were the real chief guest and extended his wishes to their glorious career. Prof. Syed Waseem Akhtar, Chancellor, Integral University addressing the guest who gathered in the Integral campus from all across India extended his whole hearted support to the young players and their families and glorifying the need to concentrate on togetherness, positive energy and the zeal to perform. He conveyed that Integral will always foster Sports and such activities where the power of self belief and determination is projected. Shri Arun Kumar Banerjee, Hony. Secretary UPTTA and Treasurer, TTFI was also present during the event expressing his delight to be among teenagers and youth with so much talent and willingness to succeed and wishing the participants and the Tournament a roaring success. The Player's Felicitation event was extravagantly conducted at the Integral Auditorium on 30th June. 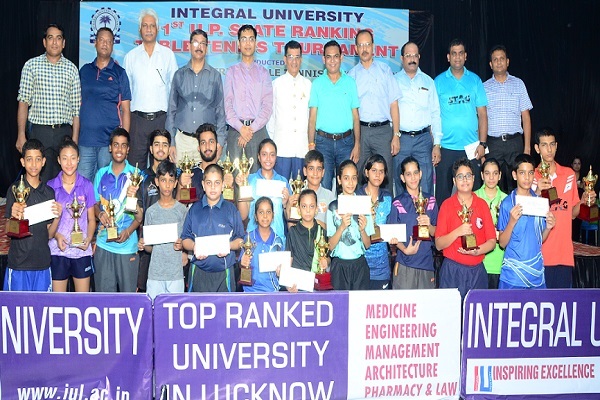 Integral University and UPTTA honored the players who have brought laurels to UPTTA and won Medals during the National Championships 2017-18. Prabhat C. Chaturvedi, President, UPTTA honored the players amidst a packed auditorium with loud cheers for the winners. Uttar Pradesh paddlers were the star of the evening receiving their awards for winning 2 Bronze medals at the 79 Cadet & Sub-Junior National Table Tennis Championships held at Goa from 14th – 19th December, 2017. 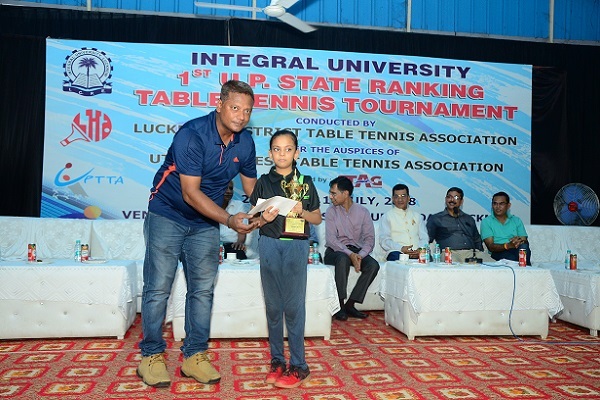 With the winners already rejoicing their titles at the 1st U.P State Ranking Tennis Tournament, Integral congratulates and wishes a great run ahead to all the players of this fast, high-tech sport of Table Tennis.